Question: What are some of your "no think" meals? my no think meals always seem to involve yogurt... it's so easy! i also will do random stir frys w/ tons of veggies & cheese or shrimp. 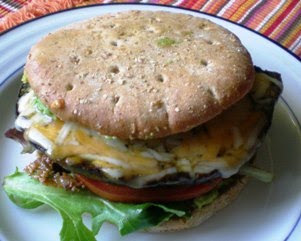 your portobello sandwich looks delish! oh those all sound great and healthy! 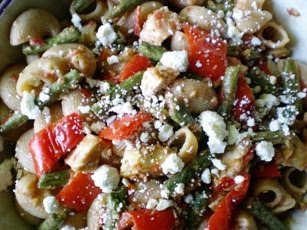 A common "no think" meal is stir-fry...or basically a big mix of whatever grain we have with veggies and other toppings! I'm definitely a stir fry girl. Easy, quick, and simple. I'm trying to go raw though so I'm going to have to find another quick meal! I do a quick chickpea and vegetable curry that I can make with my eyes closed. Tofu stirfries, stuffed red peppers and breakfast burritos all come together quick and easy at our house. who cares about easy? your dishes look amazing! Mmm, that mushroom burger looks awesome. Too busy here too and it is bad for me since I was just getting more into cooking. haha, ALL of my meals are no think!! I made tomato soup with avocado and veggies, with cheese last night. It was so easy, and so tasty. Your portobella mushroom sandwich looks amazing, by the way. My no think meals are pasta and soups. The mushroom burger is calling my name!!! My no think meals are pasta, soups and omelettes with fried rice. lol. I want a mushroom burger right now!!! A mushroom burger! That sounds fantastic! portabello mushroom burgers. YUM! i always whip up spaghetti or tacos or meatloaf. boooring. no think meals = pb & j. borning I know haha but I love it! 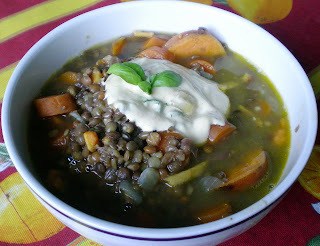 that lentil soup sounds great! Nice! That pasta salad looks amazing!! My go to/no think meals are: pepperoni pita pizzas, easy thai curry and chicken fried rice! Easy peasy/no recipe required - woo! oohhhh all those meals look delish andrea! i think my fave go to meals are canned amy's soups, junk salads and throwing together whatever i have into a stellar yog mess. hope you are having a wonderful week! Loving the burger and esp that soup, because today is a windy, chilly day! I just wish I had good bread to go with it. These days, my no-think meals are cottage cheese, refried beans,+ sweet potato fries. my "starving salads" are no think meals. i just toss and eat. My favorite no think meals are just cereal with fruit, and salads - just throw whatever veggies or fruits in there that you have on hand, plus maybe some chicken, cheese, or nuts for protein. I think hectic days must be contagious - I've had my fair share of them lately. BEANS are my fast meal! Beans + tomatoes + spices = quick, healthy and tasty. A winning equation. I haven't had a portabella burger in a while! Must do something about that. Another fast and easy meal, thanks for the idea! Great meals. My no think meals are always salads.